and her Ek'lectric Band with DJ RIMARKABLE July 9th @ LITTLEFIELD in Brooklyn, NYC. 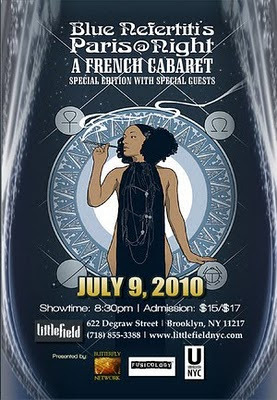 We are approaching the LAST installation of BlueNefertiti's, "Paris@Night", a French Cabaret. “Paris@Night” transforms any room into a Parisian nightclub. Seated at her cabaret table reciting the parodies of life, is the beautiful and mysterious LA FEMME BLEUE. With her sensual stage presence and satirical story-telling, she lures the audience into her world of experimental frequencies... JAZZ, SOUL, HIP HOP, DRUM'n'BASS, HOUSE, SAMBA and REGGAE. This sets the stage for artistic exchange through MUSIC, VISUAL ARTS, SPOKEN WORD, and THEATER, "Paris@Night" provides a platform for inspirational, and innovative live collaborations.